PanARMENIAN.Net - One of the sacred places is the Avarayr plain, where the battle between the Armenian forces led by Vardan Mamikonyan and the soldiers of Yazdegerd II, the sixteenth Sasanian emperor of Iran. Another shrine is the Monastery of Saint Thaddeus, or black Church (Qare Kelisa) near Salmast in Western Atrpatakan, where, according to the legend, Apostle Thaddeus was buried. Situated 20 km from Maku city, the church was built of volcanic stone instead of the one destroyed by the earthquake and got its name due to its black color. The legend has it that the first church appeared at the site in 68 year BC. The new monastery was built in 1329 and reconstructed at the beginning of the 19th century with the assistance of crown prince Abbas Mirza. Every year, a lot of Armenians and faithful from other Christian confessions pilgrimage to the Monastery of Saint Thaddeus and several small chapels located near it. The Monastery of Surb Stepanos is situated 22km west of Julfa. Dating back to the 9th century, the monastery was built with felsic tuff aslope Magharda mountain, on the right bank of river Arax. According to chronographer Mikael Asori, it was founded by Apostle Bartholomew. Decorated with unique frescos and sculptures, the monastery was reconstructed several times after earthquakes. 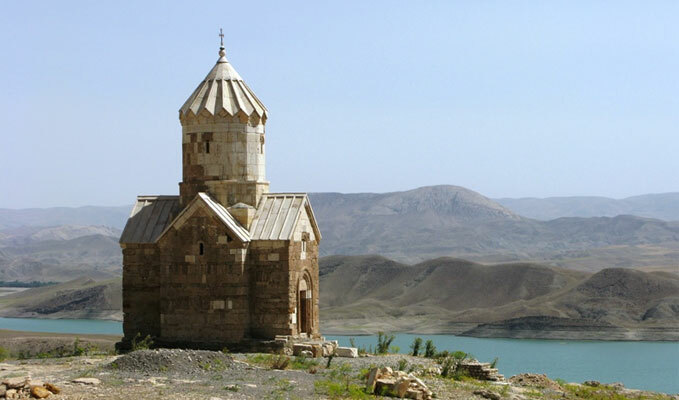 Armenian Dzordzor monastery is situated in Artaz province, with Surb Astvatsatsin chapel (9th-10th centuries), being the only construction that survived through ages. In 1987—1988 the chapel was replaced about 600 meters from its original location because of the dam construction on Makuchay river. 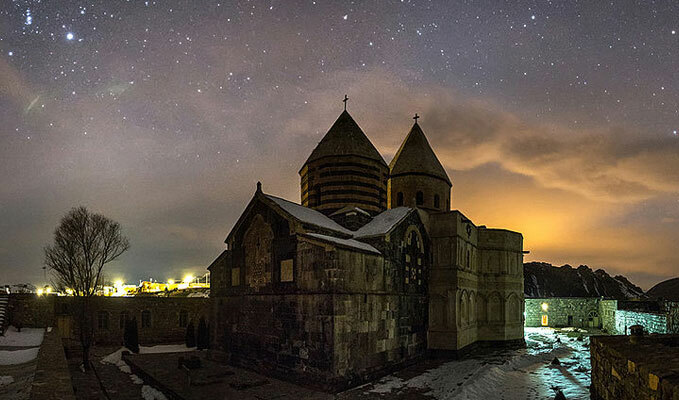 The Armenian Monastic Ensembles of Iran were inscribed as cultural heritages in the 32nd session of the World Heritage Committee on July 8, 2008 under the UNESCO’s World Heritage List. The settlers were provided with land, where a city was built and called New Julfa (Armenian – New Jugha). Thanks to industrial arts and trade with India, Armenians gained wealth in a short period of time and were granted privileges. 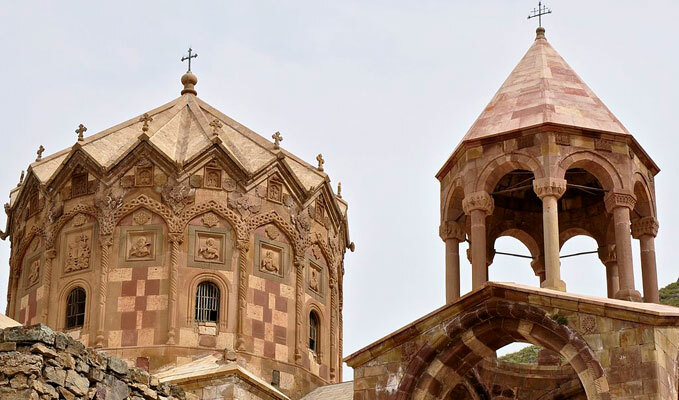 Armenians constructed churches and schools, later spreading across the country and forming neighborhoods in Tehran, Tabriz, Shiraz and other cities with exception of Khoy, Urmia and Salmast, the homeland of writer Rafii, where the Armenian population was aboriginal. 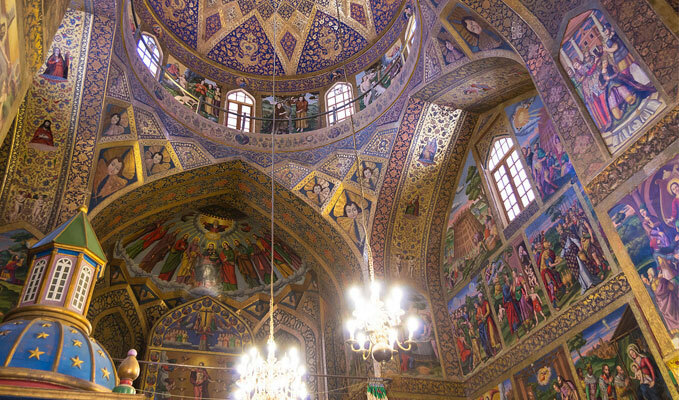 The Holy Savior Cathedral, or Vank Cathedral, is the main place of interest in Julfa. The interior is covered with fine frescos and gilded carvings and includes a wainscot of rich tile work. The delicately blue and gold painted central dome depicts the Biblical story of creation of the world and man's expulsion from Eden. Pendentives throughout the church are painted with a distinctly Armenian motif of a cherub's head surrounded by folded wings. The ceiling above the entrance is painted with delicate floral motifs in the style of Persian miniature. Two sections, or bands, of murals run around the interior walls: the top section depicts events from the life of Jesus, while the bottom section depicts tortures inflicted upon Armenian martyrs by the Ottoman Empire. A statue of Archbishop Khachatur Kesaratsi was installed in front of it. 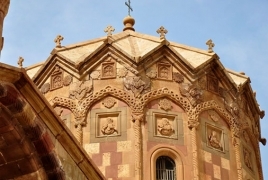 Other Armenian churches resemble each other. The best known are Saint Mary (built in 1613) and Saint Kevork (built in 1611) churches in Isfahan. Sources say that the latter was built with the stones the settlers brought with them from a destroyed church in Armenia. Holy Bethlehem Church was built in 1628. The decorations and paintings on its walls depict the life of Jesus. The 72 exquisite paintings, created by Armenian artists, are presented in two rows. In the lower row the paintings are painted sequentially, but in the upper row each painting is placed in a separate frame. The architecture and the gilded decorations of the church's dome are notable. The inscriptions inside the church eternize those who did charitable work for the church. The neighborhood with old houses and narrow streets is a perfect place for walking. 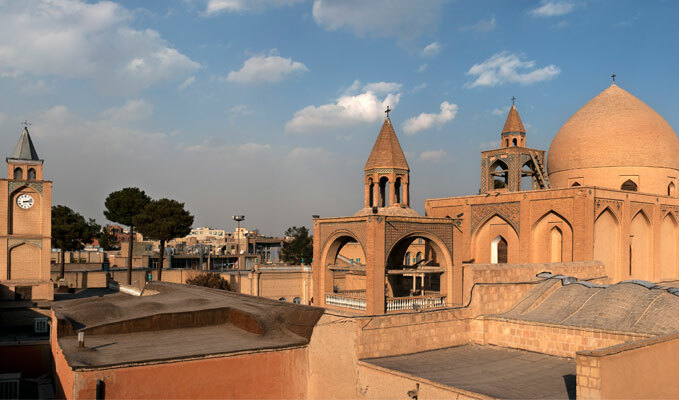 Saint Mary Church in Tabriz, the fourth biggest city of Iran, dated back to the 6th century. It was once a residence for the regional archbishop.